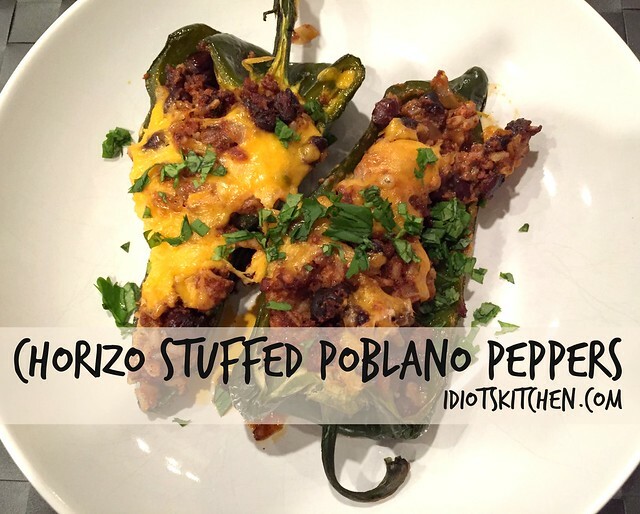 I have never been a huge fan of the traditional stuffed pepper but I’ll take these Chorizo Stuffed Poblano Peppers any day of the week! 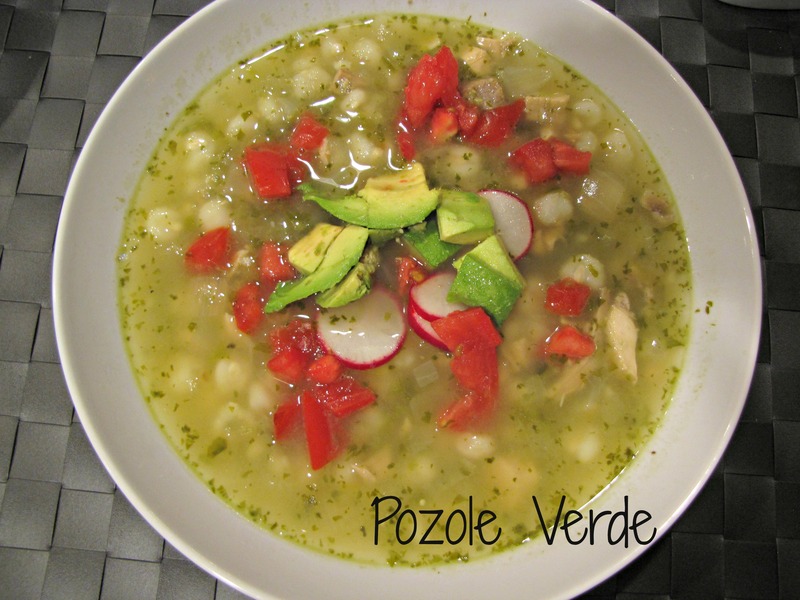 If you’re not familiar with poblanos, you should give them a try. They are a mild pepper – not spicy, burn your tongue, clear your sinuses hot like a jalapeño but definitely have more flavor than a regular bell pepper. 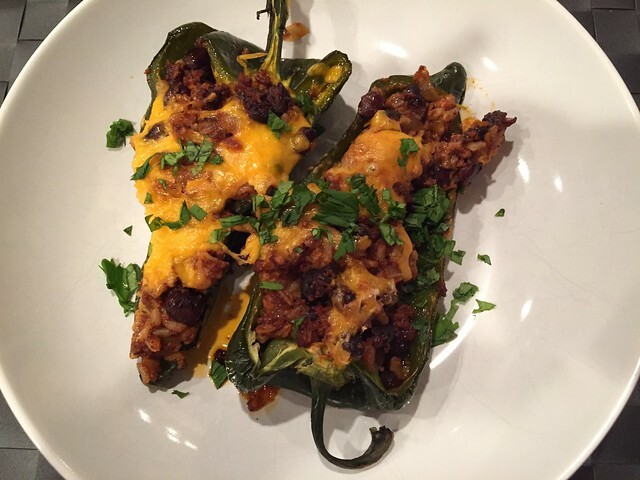 If you’re used to making stuffed peppers with the traditional rice and ground beef in a green bell pepper, I think you’ll be (pleasantly) blown away by the flavors of chorizo, black beans, and cheese in these poblanos. Time kick those tired old stuffed peppers up a big notch! 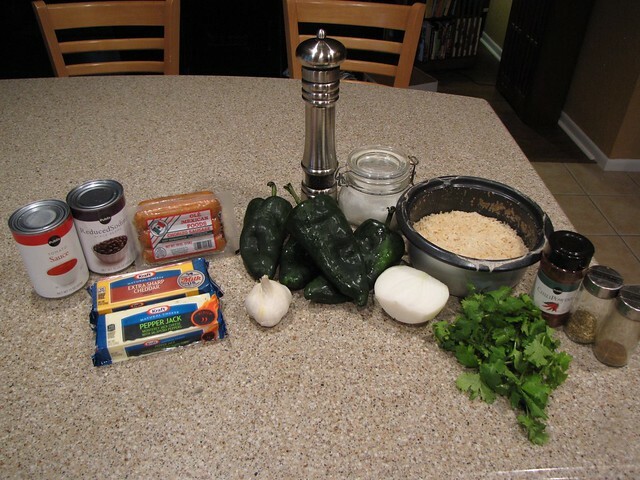 For this recipe, you want to buy the crumbly kind of chorizo, sometimes called Mexican chorizo rather than the firm Spanish kind that looks more like smoked sausage. This comes 6 links to a 1 pound package with each link wrapped in a little plastic-like casing that you must remove. Remove the chorizo from its casings by cutting off one end and squeezing the little meat chunks out the other like you would a toothpaste tube. 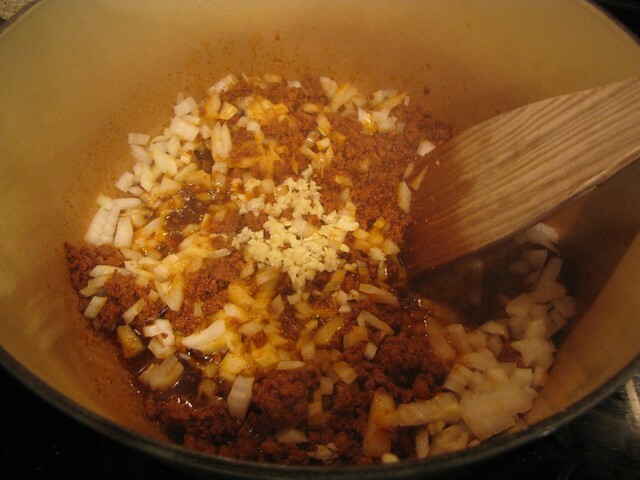 Place the chorizo in a large pot over medium high heat and cook, stirring frequently, until it has browned and cooked through. 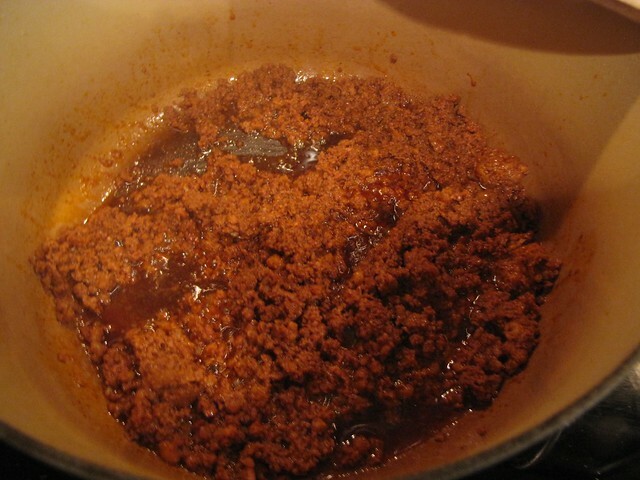 As you can see, my chorizo has quite a bit of extra grease in it so I don’t add any oil to the pan before browning. That also gives me enough liquid/fat to sauté the other vegetables. Finely chop 1 medium onion and 2-3 cloves of garlic and add them to the pot. Sauté until golden and tender, about 5 minutes. I’ve gotten in the habit of making rice in advance to have on hand for recipes like this, Fried Rice, adding to soups, or for making a quick rice salad. I cooked 1 cup of brown rice (white rice works too) in 2 cups of water. 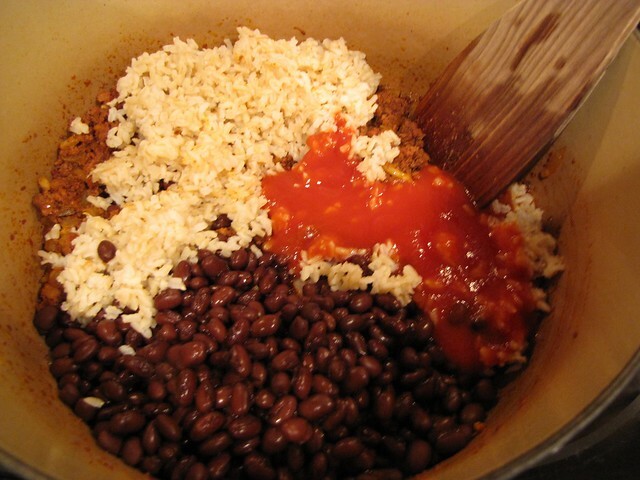 You really only need about 1 – 1½ cups of rice so you will have some leftover. Add about 1 heaping cup of rice and 1 (14 oz.) can of drained and rinsed black beans to the pot. 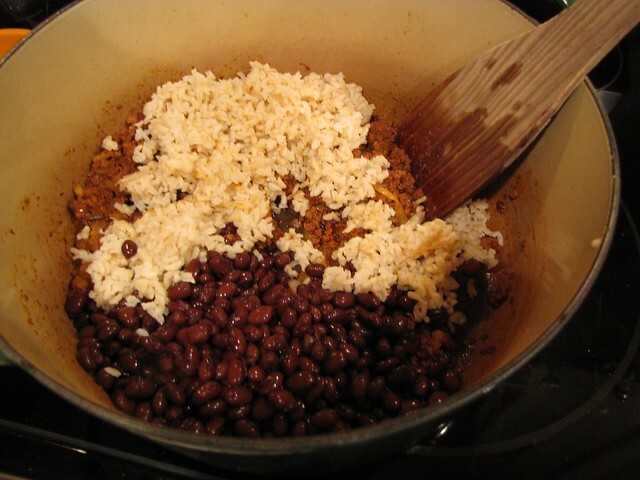 You might need more or less rice depending on how much your chorizo shrinks up during cooking. 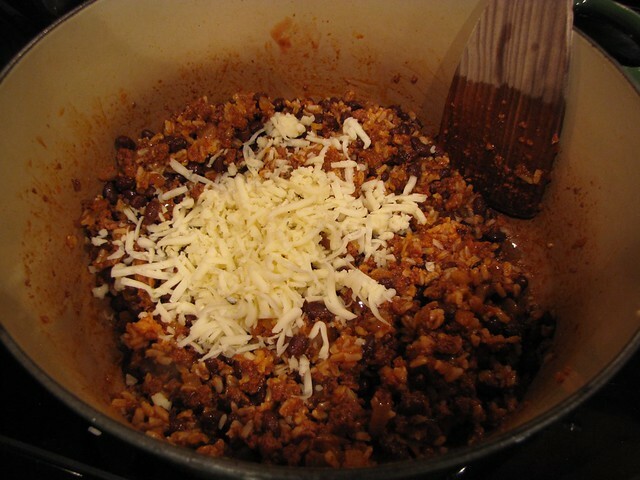 Add ¾ cup of tomato sauce and about ½ cup of shredded pepper jack cheese. 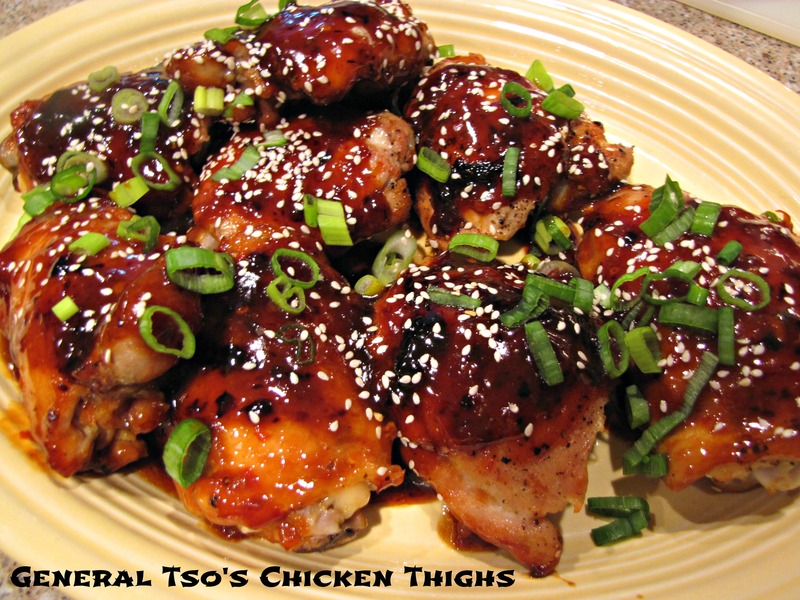 Season with 1 Tablespoon chili powder, 1 teaspoon cumin, 1 teaspoon oregano, and salt & pepper to taste. These do NOT have to be exact measurements – you might want a little more or less rice or need a little more tomato sauce to make it well blended. When you’re buying your poblano peppers, try to get nice fat, wide ones that would be good for holding stuffing. Some of mine were a bit narrow and posed a stuffing challenge. 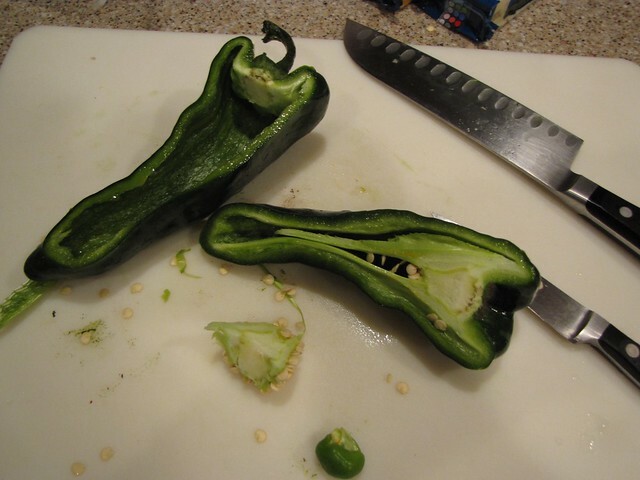 Cut the peppers in half lengthwise and leave the stem intact. 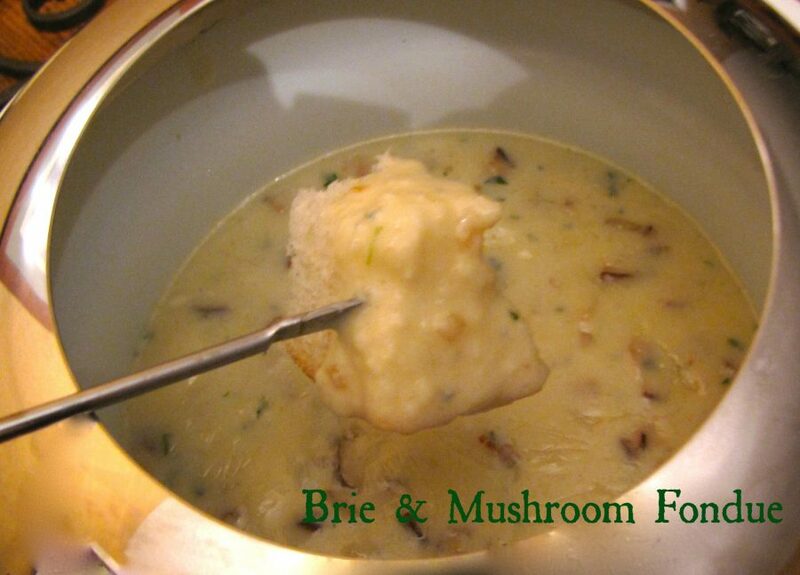 Scoop out the seeds and use a small paring knife to remove the white, inner membrane. If you have sensitive hands, you might want to wear a disposable glove to work with the peppers. Again, they’re not even close to being as hot as a jalapeño pepper, but they do make my fingertips tingle if I cut up too many without wearing gloves. 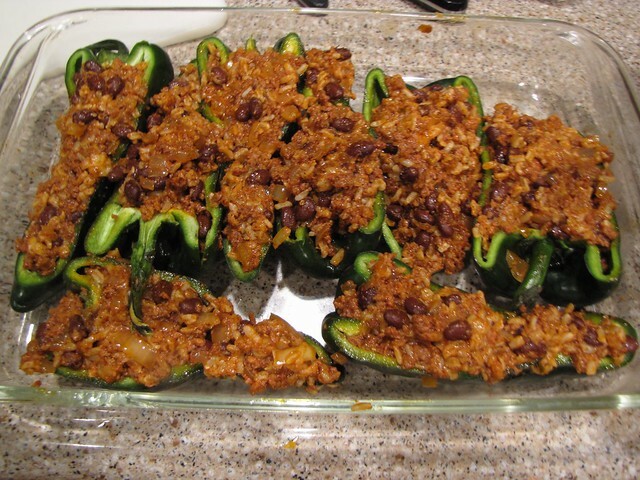 Place your pepper halves in a large baking dish and fill them with the chorizo stuffing. If you have stuffing leftover, it’s GREAT rolled into a burrito or taco for lunch the next day. Or eaten with a big spoon right out of the pot. 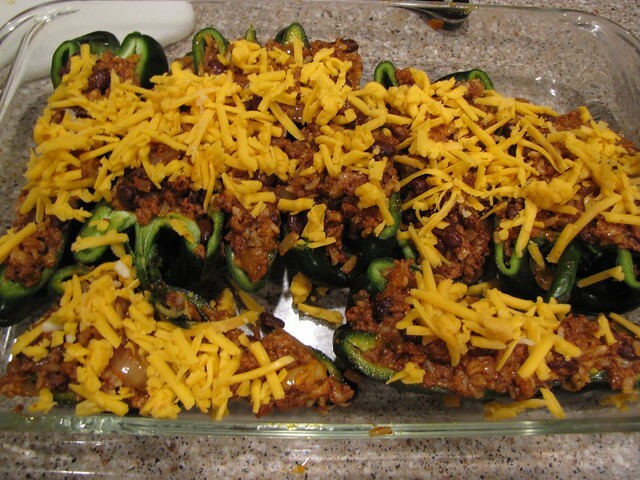 Cover the top of the peppers with grated cheddar cheese. If you don’t want to buy 2 kinds of cheese, you can use the same cheese in the stuffing as you use for the topping. I happened to have both on hand so I mixed it up. Cover the pan loosely with foil and bake at 375° for about 40 minutes or until the peppers are tender. Remove the foil and return the pan to the oven for an additional 5-10 minutes OR place under the broiler for 1-2 minutes to further melt the cheese and get just a hint of golden, crispy topping. Serve garnished with chopped fresh cilantro. You could make this a fun themed dinner by adding Guacamole with chips or served as a salad. 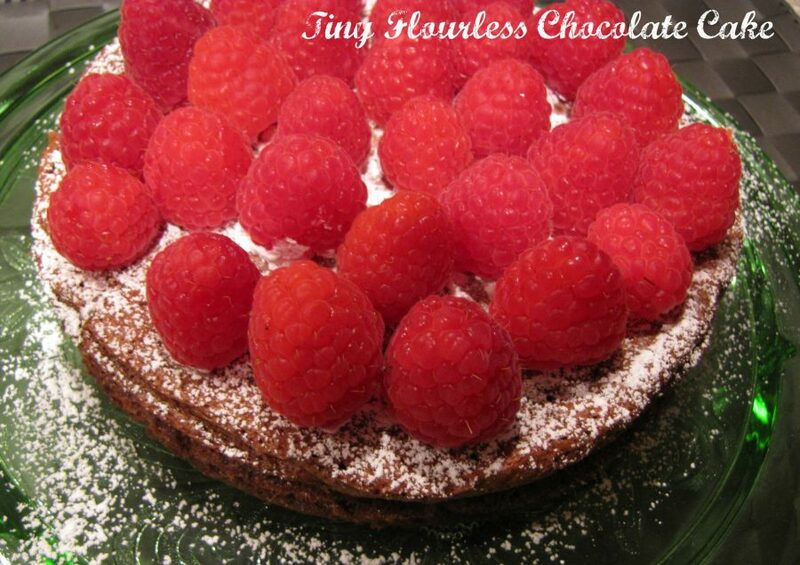 I usually also try to have something fresh and light like a chopped tomato or cool Cucumber Salad on the side. 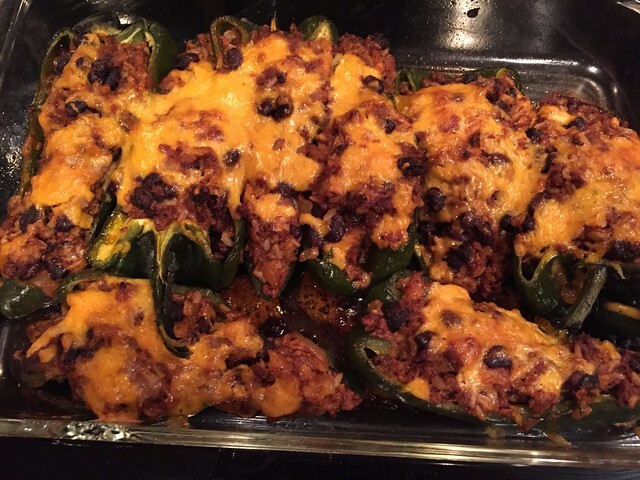 Chorizo Stuffed Poblano Peppers have shot to the TOP of my list for stuffed peppers. Feel free to use this recipe as a template and make them your own with different beans, salsa, cheese, or whatever you have on hand. I’ve been on a little bit of a poblano pepper kick lately so you’ll see them again soon in a soup recipe. 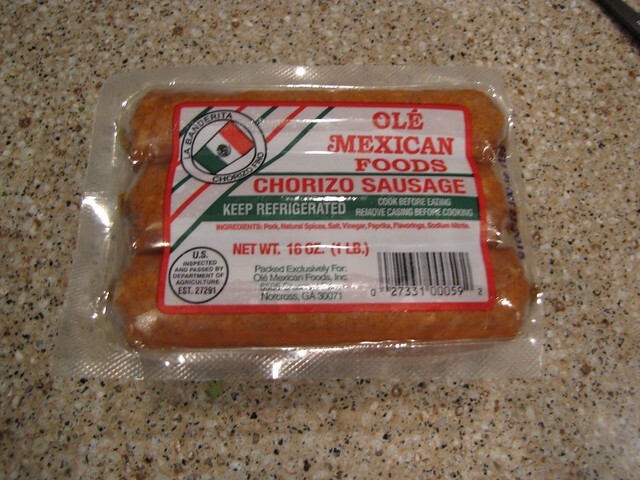 Is there some sort of vegan chorizo thing you could use? Otherwise, I’d say just add some extra veggies and go for it! When Mark shares this to my page on f.b., I guess I’d better make it.